An image grab made from a video released Oct. 5, 2015, by the Russian Defense Ministry reportedly shows a Russian aircraft dropping bombs during an airstrike against Islamic State group's positions at an undisclosed location in Syria. The battle between Syrian forces — backed by Russian air power — and rebel fighters played itself out on social media over the course of several hours. “Reports that Jaysh Al-Fatah has began its long-awaited offensive on Morek,this is going to be decisive,” tweeted Abdel Rahman, a self-described history major with more than 3,300 followers, who goes by the Twitter handle @VivaRevolt. In the interim, groups like the London-based Syrian Observatory for Human Rights, confirmed reports of fierce fighting in the area, part of a larger rebel counter offensive against the Syrian regime. Whether the rebel forces took or can hold Morek, a town north of Hama along the strategic M-5 highway, Western officials say the fight illustrates the difficulties Russia is facing as it tries to carve out a larger stronghold for Syrian President Bashar al-Assad. Moscow has shown an inability to make decisive gains, despite a clear advantage with air power. The assessment was backed by a U.S. intelligence official, who said the Russian-supported offensive is making “only marginal gains on the ground,” despite the help of Iranian forces and fighters from the Iranian-backed terror group Hezbollah. 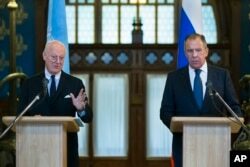 Russian Foreign Minister Sergey Lavrov, right, listens as U.N. Special Envoy for Syria Staffan de Mistura speaks during a news conference following their talks in Moscow, Russia, Nov. 4, 2015. The official also suggested that Russia’s efforts to support Assad may be faltering because of unfamiliar conditions on the ground. Still, pro-Assad forces have been claiming their share of success. Syrian state television said Wednesday the regime’s forces captured a key road to Aleppo from the Islamic State terror group, breaking what had been a two-week-long siege. 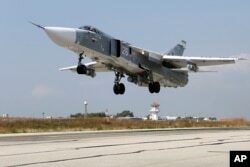 In this photo taken from Russian Defense Ministry official website on Oct. 6, 2015, a Russian SU-24M jet fighter takes off from an airbase Hmeimim in Syria. 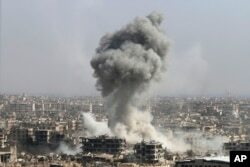 Russian officials also said Wednesday their jets had struck more than 200 terrorist targets over the previous 48 hours, taking out a training camp near Aleppo, and underground shelters and other terrorist fortifications in Homs province. Intelligence officials from within the Middle East are cautioning against any rush to judgment. Talabani, in Washington for meetings with U.S. officials, said the Russians do not necessarily need to strike decisive blows to reach their goals. Russian servicemen carry the coffin of Vadim Kostenko, one of the Russian air force's support staff in Syria, during his funeral in the village of Grechnaya Balka, north-west of Krasnodar, Russia, Oct. 28, 2015. Officials also acknowledge that facts on the ground in Syria are prone to change quickly. A U.S. intelligence official noted that while the Russian-backed offensive is “progressing slowly,” Assad’s allies have been steadily applying more pressure since the start of last month. And the growing ground force is sizeable, with intelligence officials estimating there now are likely 10,000 or more pro-Assad troops in Syria. 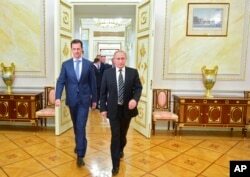 Recent reports suggest the size of the Russian force alone in Syria may have doubled in recent weeks to 4,000 troops. Russian President Vladimir Putin, right, and Syria President Bashar Assad arrive for their meeting in the Kremlin in Moscow, Russia, Oct. 20, 2015. Some current and former officials warn, however, that Russia’s Syria policy faces a similar shortcoming that has plagued U.S. and Western efforts in the Middle East and elsewhere: Air power alone cannot win a war. “[Russian President Vladimir] Putin will find in three months, six months, 12 months that the battle tide has turned against Assad, despite his military presence,” said former U.S. ambassador to Ukraine John Herbst, now with the Atlantic Council’s Eurasia Center. “Then he’s in the difficult position of having to seriously escalate Russian intervention, putting in tens of thousands of Russian troops, or watching his ally go down in defeat despite Russian planes," he said.